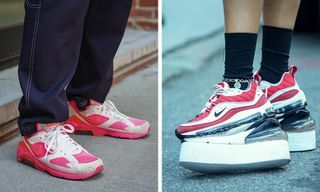 At the end of last year, we at Highsnobiety looked carefully at the full year in review, picking the best sneakers of the year (read why our number one pick went to the Nike React Element 87) and the footwear moments that had defined the previous 12 months. Now, we have partnered with StockX to crunch the numbers, bringing you a comprehensive, by-the-numbers recap of the year in sneakers. Together with StockX’s Detroit-based data wizards, we picked nine categories that highlight the best the sneaker world had to offer in 2018. 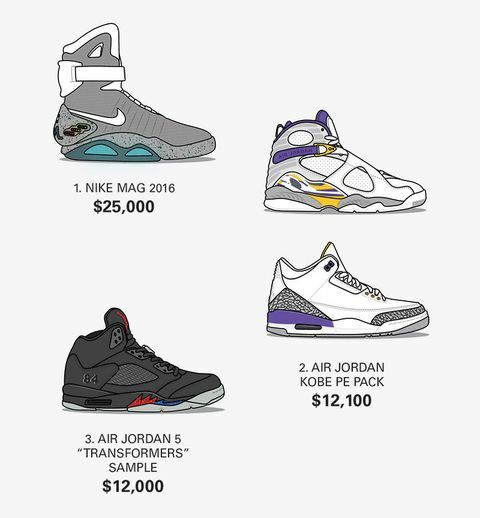 We’ve highlighted everything from the most sold and most expensive shoes to the most profitable and even the day of the year sneakerheads spent most on kicks, courtesy of StockX data and illustrations by Dan Freebairn. Check out our findings below, also don’t miss the illustrataed recap video below, then head to the comments to leave your thoughts. Unsurprisingly, the top-seller category includes some of the most iconic sneaker silhouettes, plus a few newcomers from YEEZY. 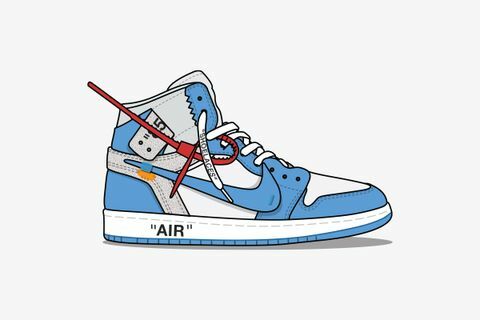 The Nike Air Jordan 1 lands on the top of the podium for this category (there were 184 Jordan retro releases in 2018, and 60 of those were Jordan 1s) followed by the adidas Originals YEEZY Boost 350 V2, both of which stayed at top of mind throughout the year due to key releases that sustained interest in the silhouettes. 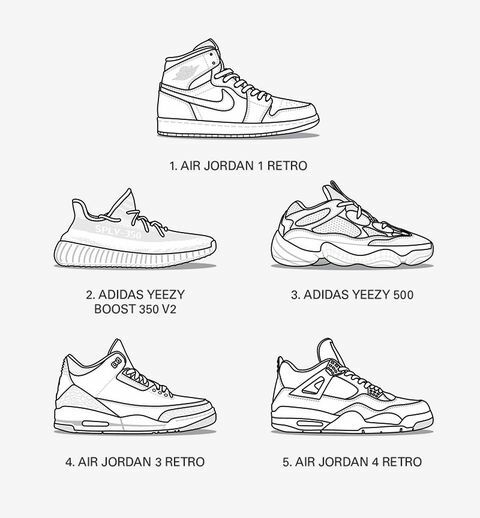 Comparatively, there were only seven individual 350 V2 drops throughout the year, and four releases of the 500. 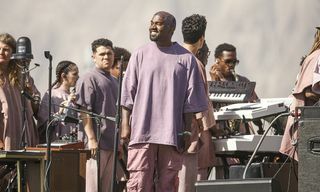 Whereas the top five best silhouettes was a neck-and-neck contest between adidas and Nike, YEEZY reigns supreme when it comes to the three overall best-selling sneakers of 2018. Based on 2018 sales volume on StockX, the “Butter” adidas YEEZY Boost 350 V2 released in June was the most-sold sneaker of the year, accounting for 17% of the top ten sneakers sold on the platform. 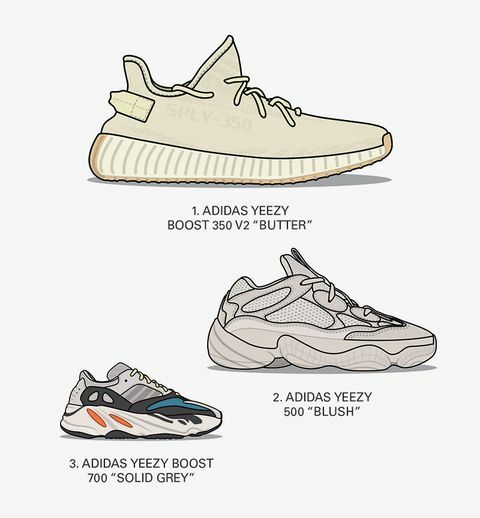 Speaking to the sheer volume of YEEZYs that adidas is producing, in second we find the “Blush” YEEZY 500, representing 14% of the top ten sneakers sold from 2018, and in third was the “Wave Runner” YEEZY Boost 700, which first released in 2017 but was still the third most-sold of 2018, boosted with numbers from a 2018 re-stock. The “Cream White” 350 V2 was reportedly the biggest YEEZY drop ever, and therefore not scarce enough to be listed as much as other YEEZYs on StockX. The three most expensive sneakers sold on StockX in 2018 featured some kicks that most people will likely never even see in person, much less rock. There were no surprises as one of the most iconic movie-to-IRL crossovers ever, the Nike Mag from 2016, lands in the top spot with an average resell price of $25,000. 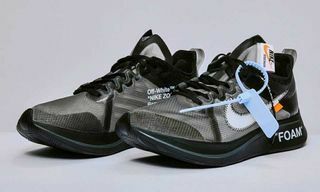 The other two sneakers, the Kobe player exclusive Nike Air Jordan pack consisting of the AJ8 and AJ3 (Kobe wore this Lakers colorway during his only free agent season in 2002-2003, when he was not signed to any sportswear brands) and the 2017 “Transformers” Nike Air Jordan 5, came in second and third respectively. 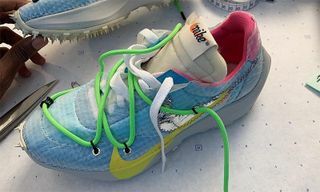 In this category, rarity and nostalgia played a big role in how much people were willing to pay for the sneakers on the resell market. 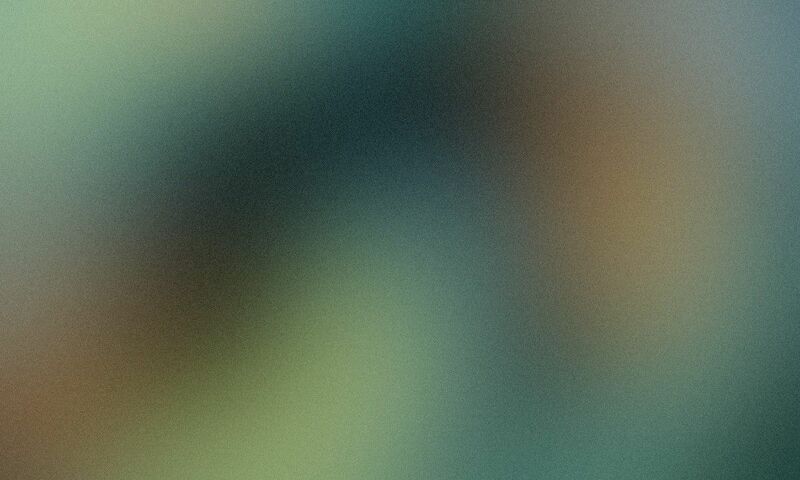 The latter sample was reportedly produced for Mark Wahlberg for his role in the movie. Now we turn our attention to the sneaker with the biggest absolute difference (in dollars) between their retail price and resell price. 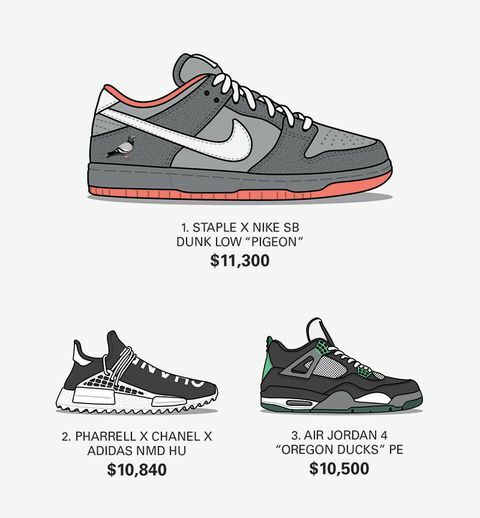 Those were the original Pigeon Dunk SBs from 2005, the Chanel x adidas Human Race NMDs which were released right before the closing of Parisian boutique colette, and the Oregon Ducks Nike Air Jordan 4 player exclusive, all of which netted their sellers over $10,000 above retail. While the Oregon-exclusive Jordan 4s did not sell at retail, we calculated the premium based on the shoe’s retail price. 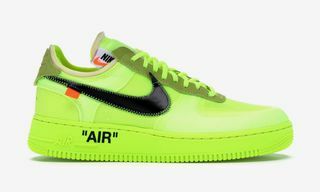 When it comes to the biggest price premiums as a percentage (restricted to sneakers with at least 100 sales, compared to the above chart which shows absolute premium), most of Virgil Abloh’s OFF-WHITE x Nike products were sure-fire investments in 2018. 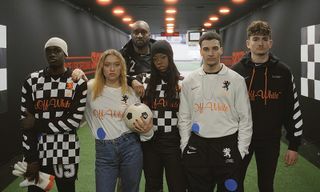 This underlined Virgil Abloh’s unwavering influence in the sneaker world and speaks to just how safe of a speculative cop his “The Ten” collection has been for sneakerheads, even with over 30 shoes having been released since late 2017. 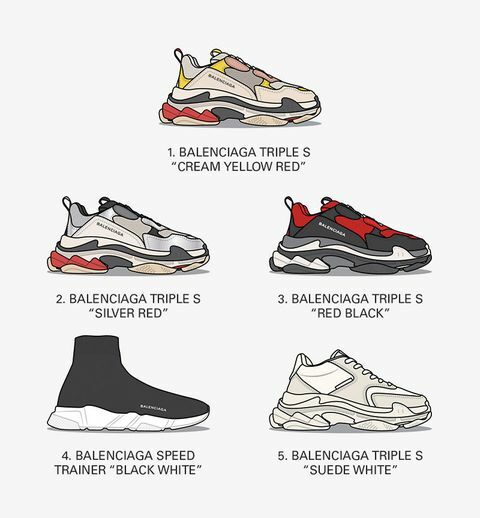 Of the top 5 best-selling luxury kicks, every single one is a Balenciaga sneaker. The extra chunky Triple S’s star might have been fading in late 2018 but it still did enough to end up head and shoulders above the competition, landing on the list four times. While not as popular as it once was, the Triple S is clearly still a favorite for those with a taste for chunky, high-end kicks. Note that we’ve defined luxury sneakers as those with a retail price at or above $400. We also took a look at which three sneakers had the largest long-term price decreases. 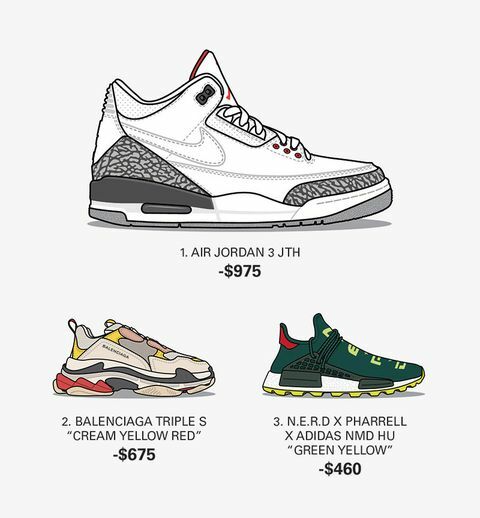 Those were the JTH Nike Air Jordan 3 (which dropped $975 in value from their peak), the “Cream Yellow Red” Balenciaga Triple S (good for a $675 loss), and the green and yellow N.E.R.D. adidas NMD Hu ($460 in the minus). 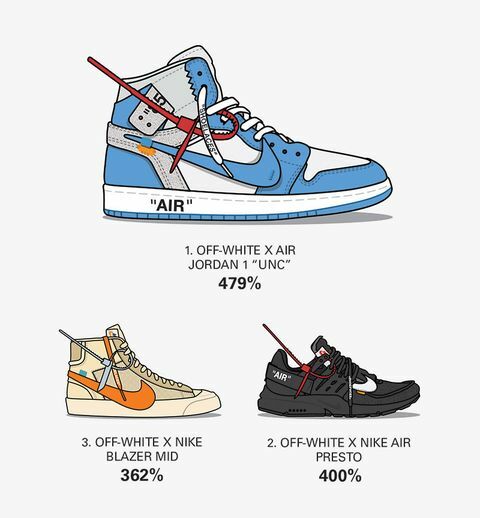 The final two categories looked at what days saw the biggest spending (notwithstanding holidays like Black Friday) by sneakerheads on StockX. 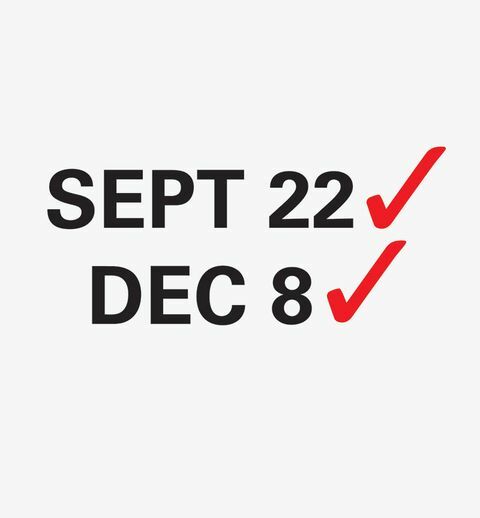 The biggest single day for sneaker sales turned out to be September 22, which saw the release of the “Pine Green” and “Court Purple” Air Jordan 1s, as well as a “Cream White” YEEZY 350 V2 restock. The biggest day for a single shoe was December 8, the day that the “Concord” Air Jordan 11 dropped, further highlighting just how universally popular OG retro Air Jordan colorways can be, even amongst a vastly different community of sneakerheads, some of which may be too young to remember just how influential Michael Jordan actually was.